Xiaomi today launched its latest smartphone in the Redmi Note series, dubbed Redmi Note 5 Pro in India. The smartphone comes with some latest features which has made the mid-range price segment even more competitive. The Redmi Note 5 Pro price in India starts from Rs. 13,999 which places it in a segment that is already crowded with devices from the likes of Honor, Motorola, and Xiaomi itself. If we talk about features in this price segment, features like dual rear cameras and 18:9 display are quite usual these days and Xiaomi has also joined the trend with the Redmi Note 5 Pro. So, now there is another phone in the mid-range segment which you can consider buying. 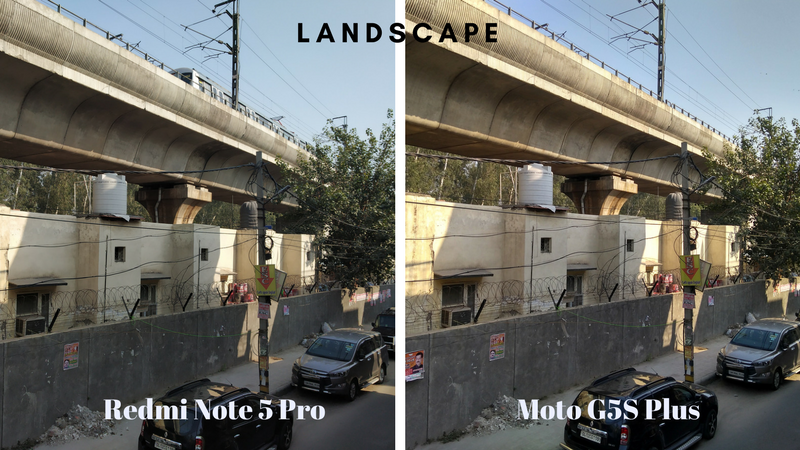 Here, we are doing a comparison between two popular mid-range devices in India right now – the Xiaomi Redmi Note 5 Pro and the Moto G5S Plus. Starting with the cameras which are the highlight of Redmi Note 5 Pro, the phone comes with dual rear cameras that include a 12MP primary sensor along with a 5MP secondary sensor for depth effects. The rear camera also comes with PDAF and LED flash for improved focusing and low-light performance. 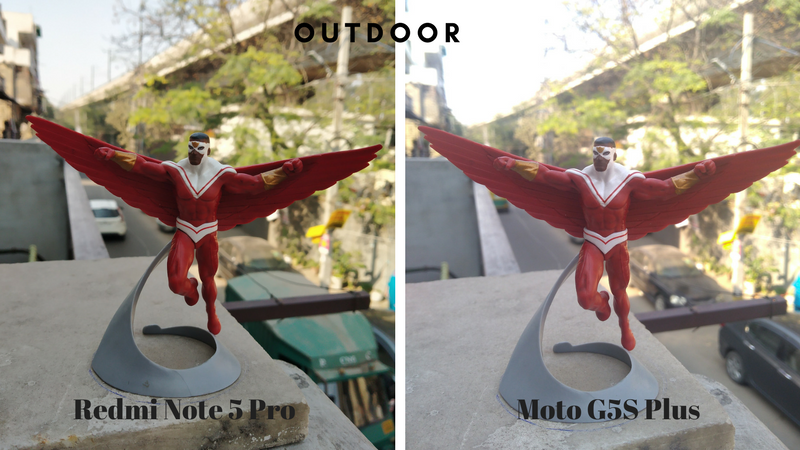 The Redmi Note 5 Pro camera clicks decent pictures in all lighting conditions and offers bokeh effect. 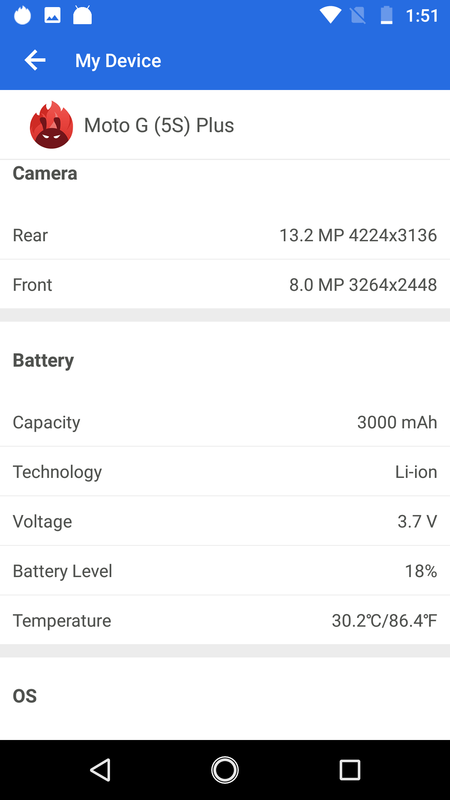 Up front, there is a 20MP Sony IMX 376 sensor with LED selfie light and Beautify 4.0. It can also record 1080p videos at 30fps. The front camera has also performed well in our initial testing. 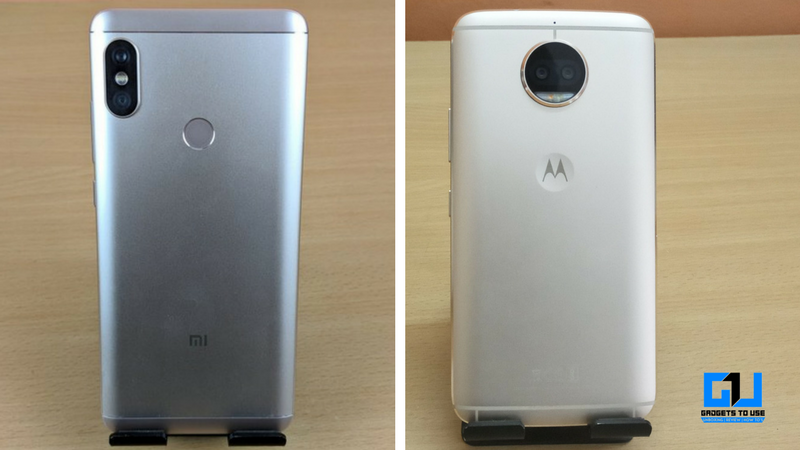 The Moto G5S Plus also comes with dual 13 MP cameras at the back with f/2.0 aperture and dual LED flash. 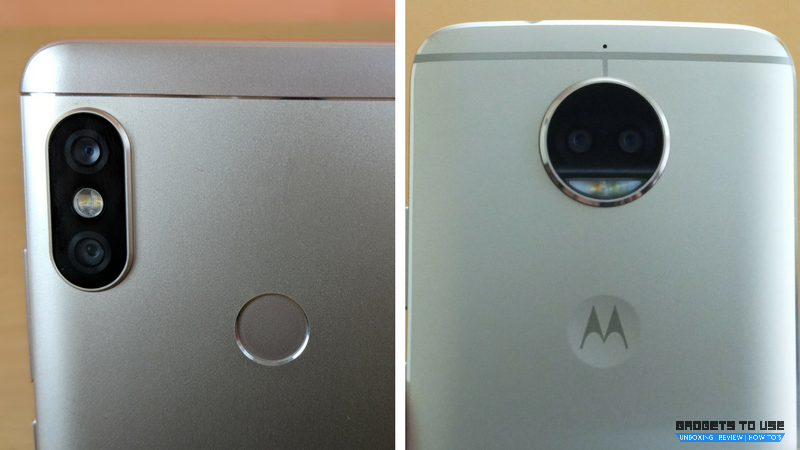 There is an 8MP front camera with f/2.0 aperture and LED flash. The G5S Plus rear cameras also offer good depth effect. 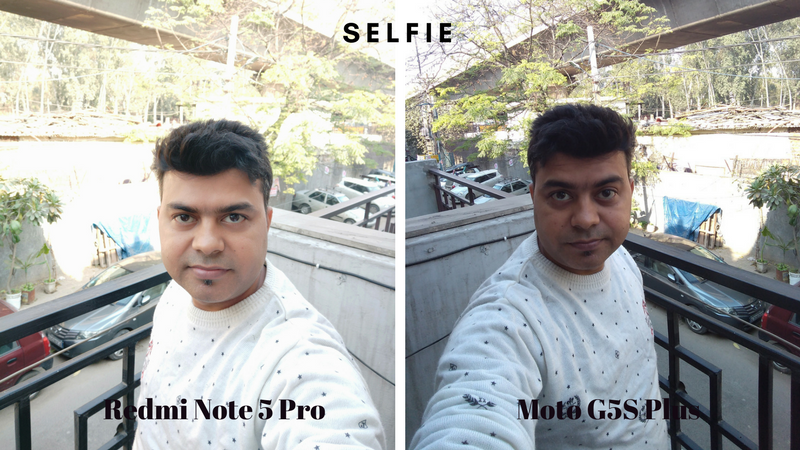 But overall, Redmi Note 5 Pro has an upper hand because of its good selfie camera. The Xiaomi Redmi Note 5 Pro comes with the latest Qualcomm Snapdragon 636 octa-core processor with Adreno 509 GPU. The phone comes with two RAM options- 4GB and 6GB. It has 64GB of internal storage which is also expandable. 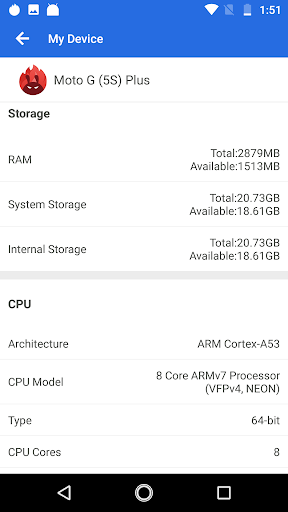 The octa-core processor clocked at 1.8 GHz with at least 4GB RAM is sufficient enough for moderate to high usage. 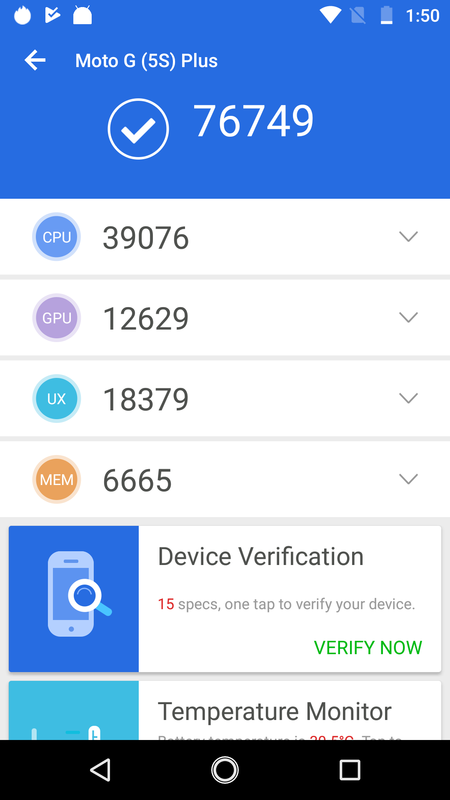 The Moto G5S Plus is powered by an octa-core Qualcomm Snapdragon 625 chipset which is a little less powerful than the Snapdragon 636. Also, the phone comes with only 4GB RAM and 64GB storage option. 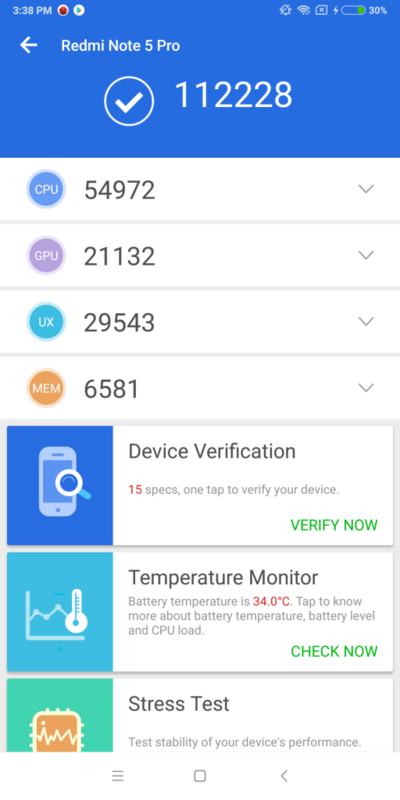 So, if we see hardware section, Redmi Note 5 Pro again seems to offer better performance. The Snapdragon 636 with 4GB or 6GB RAM performs better on Antutu benchmarks. The Redmi Note 5 Pro features a 5.99-inch full HD+ display with a resolution of 1080 × 2160 pixels. The display comes with very thin bezels on each side because of it’s 18:9 aspect ratio. 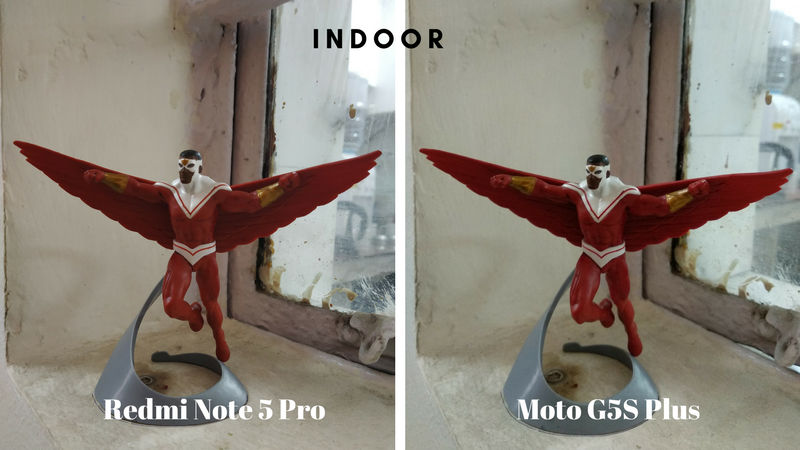 The display of Redmi Note 5 Pro is decent and comes with good sharpness and brightness levels in all conditions. It comes with a 2.5D Curved Corning Gorilla Glass on top. The Moto G5S Plus comes with a 5.5-inch Full HD (1920 × 1080 pixels) display, which is lower in resolution and also lacks the 18:9 aspect ratio. The only good thing about Moto’s display is, it has Corning Gorilla Glass 3 protection. 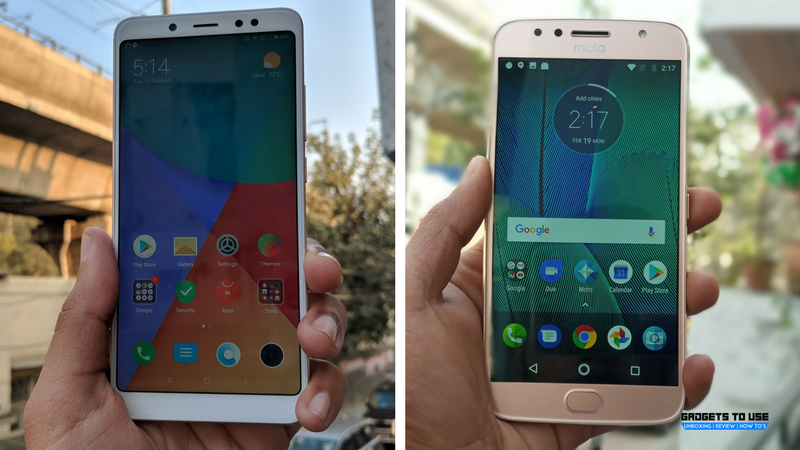 Overall, in comparison to the Redmi Note 5 display, Moto G5S Plus looks obsolete in the times of 18:9 displays. Starting with the design first, Xiaomi has continued with its metal unibody design but this time the design has been refreshed and it stands out from all other phones in this segment. The Redmi Note 5 Pro sports a glass front and metallic back design which is common for a mid-range device. However, the phone is very sleek and lightweight which makes it easier to hold in one hand despite the big screen size. The Moto G5S Plus offers nothing new in terms of design. While it sports a solid metal body with water-repellent nano-coating, the phone is not so sleek in comparison to Redmi Note 5 Pro and also looks a little older in terms of design. 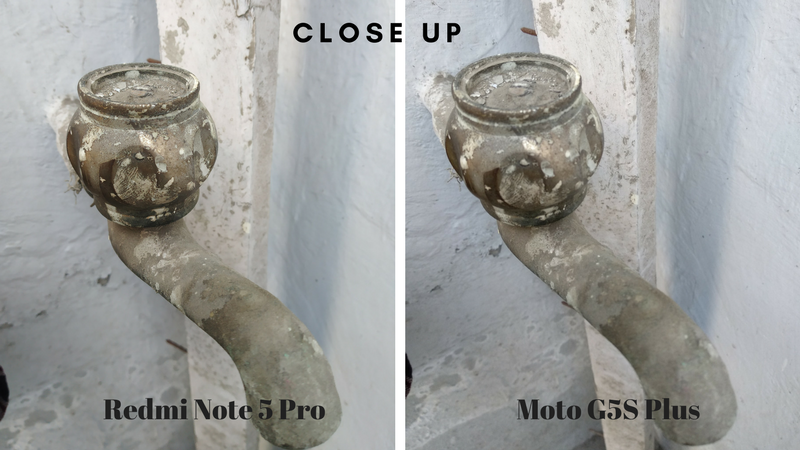 So, we can safely say that Redmi Note 5 Pro wins with its sleek metal design. 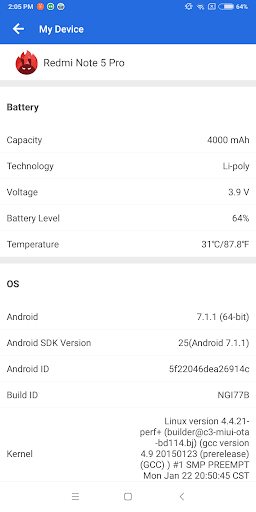 When it comes to software, Xiaomi is a little bit late in providing the latest Android version. The Redmi Note 5 Pro comes with Android 7.0 Nougat with Xiaomi’s MIUI 9.0 skin on top. The Moto G5S plus runs Android Nougat out of the box. 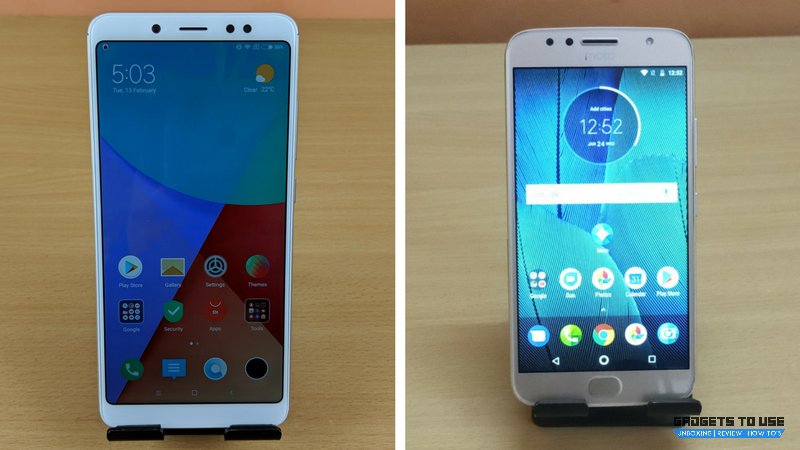 There is no word when these phones will get Oreo update, however, Motorola has been rolling out the Oreo to most of its phones recently. Talking about the battery, the Redmi Note 5 Pro comes with a massive 4,000mAh battery while the Moto G5S Plus is powered by a 3,000mAh battery. With 25% more battery capacity than the Moto G5S Plus, the Redmi Note 5 Pro will definitely offer more battery life. As we have mentioned above, the Redmi Note 5 Pro is the latest phone from Xiaomi that comes loaded with some great features. In terms of design, display, and hardware the phone has an upper hand over the Moto G5S Plus. 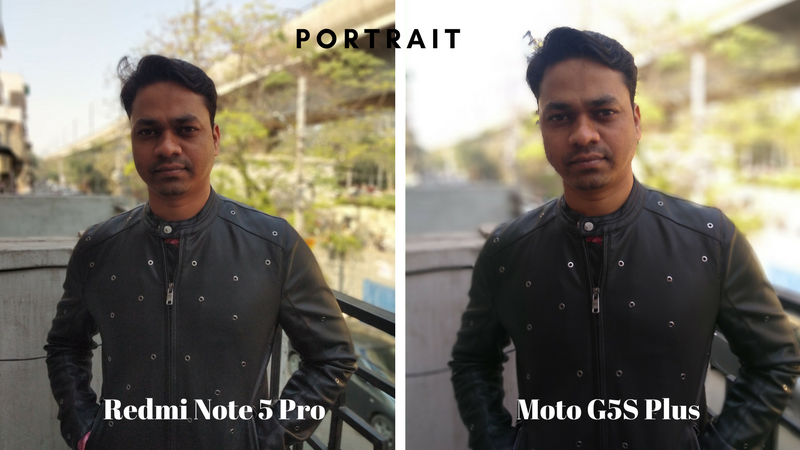 Camera wise also, the Redmi Note 5 Pro offers better camera quality at both front and rear. 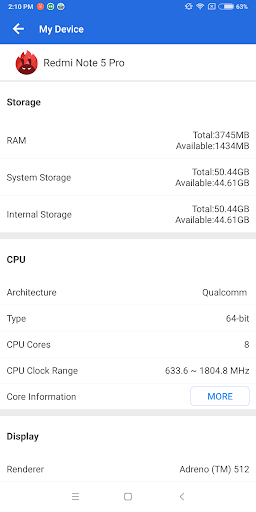 Overall, if we consider all these facts, the Redmi Note 5 Pro is a better option in the mid-range segment.